Close your eyes and think about your summer holidays. Do you imagine yourself lying on the beach, sun bathing and swimming in the sea? Of course you do! The average traveller spends nearly 3 hours a day sunbathing. That means on a two-week trip you could be spending over 40 glorious hours relaxing in the sun! Are you ready for your next sunshine holiday? When looking for the perfect sun-and-sea holiday destination, take into consideration the weather, the location, and the vibe you're looking for. Do you want a beautiful ocean island, or a calm seaside retreat? Are you looking for somewhere quiet, off the beaten path, or are you looking for a beach party scene like no other? Two of the most stunning groups of islands in the world offer you a whole range of warm getaways: the Canary Islands and the Balearic Islands . The Balearics are in the Mediterranean Sea, between Spain and Sardinia. With turquoise waters and white sands, each of the four islands offers a different selection of activities and sights, from secluded coves to packed beach parties. For a unique beach holiday a little further afield, few destinations compare to the beauty found in the Canary Islands, an autonomous Spanish territory in the Atlantic Ocean just off the coast of Africa. The Canary Islands islands provide year-round great weather for water sports, relaxing, or seeing the sights of this stunning volcanic archipelago. Find the cheapest flights for your holidays: find your flights a few months in advance, and try to be flexible with your travel dates to find the best deal. Also, be sure to book a round trip; buying outward and return tickets separately usually costs a lot more! Optimise the space in your suitcase: Roll up your t-shirts instead of folding them, pack your socks inside your shoes, and don't take things like towels that will already be at your hotel. Don't forget the essential travel accessories: a power adapter, a power bank for your phone, a lock for your bag, and an ebook reader with your favourite summer titles! Be sun safe: Take a bottle of good-quality sunscreen to the beach, which will protect you from cancer-causing rays, and dry wrinkly skin. Use trusted brands, and choose a sunscreen with a high sun protection factor (SPF). 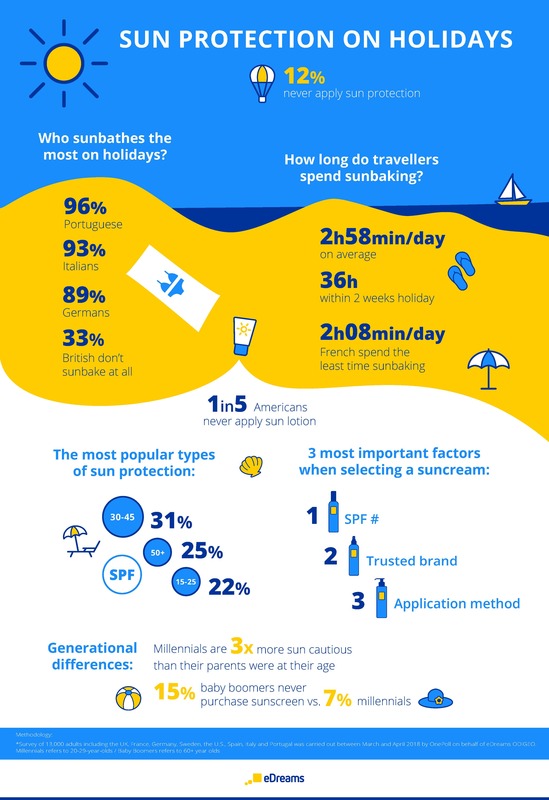 According to our study, almost a third of people choose sunscreen with an SPF of 30 to 45, and a quarter choose SPF 50+. Also remember to apply it properly, spreading it evenly over all skin that might be exposed to the sun, including round belt lines and sleeves that may slip. Book activities in advance: If you are adventurous or want to try new fun things, we recommend to book the activities before arriving to your destination. There's a variety of watersports you can enjoy in your vacations including: jetski, boat rides, flyboard and others. Find your Mediterranean escape on the islands of Majorca, Minorca, Ibiza, and Formentera. Family-friendly beaches, secluded bays, yacht and kayak cruises, hippie-vibed retreats, seaside dining and parties await! Gran Canaria, Tenerife, Lanzarote, Fuerteventura, La Palma, La Gomera and El Hierro provide a range of landscapes from black volcanic rock and inland forests to white-sanded beaches.